Blockages in the sinuses can lead to sinusitis, a condition in which the mucus membranes of the sinuses become inflamed and swollen, causing pain, pressure, and impaired breathing. Sinusitis that persists for three months or more is considered chronic. The most common procedure for treatment of chronic sinusitis is endoscopic sinus surgery. This procedure is performed to unblock the sinuses when drug therapy is not effective, or when sinusitis complications exist, such as structural abnormalities, spread of infection into the eye, or fungal sinusitis. 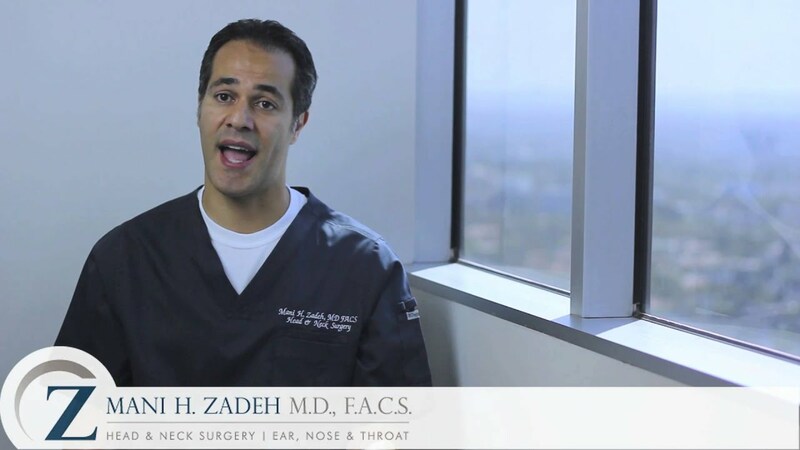 Dr. Zadeh delivers arguably the best endoscopic sinus surgery Los Angeles has to offer. In endoscopic sinus surgery, fiber-optic surgical techniques are utilized to open the natural drainage areas of the sinuses and to remove polyps, if any are present. Endoscopic sinus surgery unblocks obstructions, allowing ventilation and drainage. This provides relief from sinus headaches and congestion, improves nasal breathing, and often enhances the patient’s sense of smell. At Los Angeles Sinus Institute, Dr. Zadeh uses CT imaging and computers intra-operatively to minimize risk. Intra-operative CT guidance, or computer-aided surgery, allows Dr. Zadeh to not only view the “live images” of the procedure, but also, at the same time, to have a real time, three-dimensional CAT scan image of the area being operated on. Intra-operative image-guidance provides important anatomic information, allowing better insight into the operative field, decreasing the risks, and improving the results of surgery. Endoscopic sinus surgery is designed to improve the drainage of the sinuses and improve airflow through the nose. This procedure is also performed to relieve symptoms associated with sinusitis, septal deviations, turbinate hypertrophy (enlargement of the long, narrow, curled bone that protrudes into the nasal cavity), and nasal polyps. Reduction of the number and severity of sinus infections. Improvement of symptoms associated with sinusitis. Improvement of airflow through the nose. Improvement of the patient’s sense of smell. Endoscopic sinus surgery is performed entirely through the nostrils and no incisions are made on the skin. A thin camera rod with a light at the end to provide visualization and magnification (endoscope) is used for direct visualization of the nasal cavity and sinuses. Adjacent to the screen with the live images from the endoscope is a second screen with real time three-dimensional CAT scan images of the surgical area. Working endoscopically through the nose, Dr. Zadeh uses specialized instruments to safely and effectively remove causes of sinus blockage, such as nasal polyps, diseased bone, diseased tissue, or scar tissue. Under direct visualization and CT guidance, the natural drainage pathways of the sinuses are opened. The patient is allowed to recover from the effects of general anesthesia, and then discharged. This surgery is performed under general anesthesia and you will sleep through it. Immediately after the surgery, you will spend a few hours in the recovery room while the anesthesia wears off, until you are fully awake and feeling well enough to go home. There will be red-colored drainage from your nose after the surgery. In the first few days, you can expect the amount of drainage to decrease and the color to become lighter, although you may have blood-tinged drainage for 10 to 14 days. You may have a feeling of congestion and fullness in your nose and sinuses because of temporary swelling of the tissues in the nasal cavity resulting from the surgery. Sleep with head your elevated higher than your heart to assist in reducing swelling. Do not blow your nose for 14 days after the surgery. (You may gently sniff back nasal secretions.) After your first post-operative visit, you will begin saltwater nasal flushes with a solution we prescribe for you. Sneeze with your mouth open, and do not hold back a sneeze. Avoid all strenuous activity for 2 weeks after the surgery. Do not bend over, lift objects weighing more than 20 lbs, or perform jogging, aerobics, swimming, exercising, or contact sports. Walking for moderate exercise is acceptable. Do not smoke, and avoid secondhand smoke or any other irritating fumes. If you are suffering from chronic sinusitis, schedule an initial consultation at Los Angeles Sinus Institute. Taking all medical therapies and surgical techniques into consideration, Dr. Zadeh can determine if endoscopic sinus surgery is the most effective and appropriate treatment option for you. Why is endoscopic sinus surgery performed? When your nasal passages are obstructed, endoscopic surgery can be performed to reduce bone or cartilage within the nose structure to resolve the problem. Dr. Zadeh recommends beginning with non-surgical treatments prior to undergoing a surgical procedure. However, if non-surgical methods don’t fully resolve the problem, endoscopic sinus surgery can provide relief from blocked airways. What are the benefits of endoscopic sinus surgery? What happens during endoscopic sinus surgery? During your procedure, a small endoscopic device will be inserted through the nostril, and a fiberoptic lens on the end of the device will provide a clear image of any obstructions inside the nose. Small instruments are used to shape or remove existing cartilage and bone to clear the nasal passages. How long is recovery after endoscopic sinus surgery? Recovery will vary from person to person based on the extent of your surgery. Those who only have a small obstruction may experience a shorter recovery time than someone who had complex structural abnormalities. Your initial phase of healing will typically be a few days, but you may have some symptoms lingering for a few weeks after the procedure. Dr. Zadeh will monitor your progress and give you aftercare instructions to aid the healing process. Will I see an improvement of my symptoms? Yes, the vast majority of patients see a dramatic improvement of their symptoms. Dr. Zadeh uses imaging technology to get real-time feedback during the procedure, allowing him to perform fine changes in the inner structure of your nasal passages. As your nose heals from the procedure, you will likely notice a significant improvement in your quality of life, with clear and unobstructed breathing.